New York - The Charedi riots of the last several weeks in Jerusalem have caused and will continue to cause irreversible damage to the Charedi community on a massive scale, according to Charedi public relations consultant Ezra Friedlander. The founder of Brooklyn’s Friedlander Group, Friedlander has extensive contacts in both the Charedi and non-Charedi community—and says that non-Charedi donors are divesting from Charedi-run organizations because of the riots. “It is a fact that … humanitarian and chesed organizations founded by and under Charedi management that serve all regardless of affiliation have begun to suffer from a pullback of support from their non-Charedi base of affluent Jewish philanthropists because of the distributing images emanating from Jerusalem,” said Friedlander in an exclusive interview with VIN News. “It is common knowledge by those who are responsible for fundraising that the community in Israel enjoys widespread support by Jews around the world who appreciate the vast social service and humanitarian chesed infrastructure run by Charedi organizations in Israel,” he explained. “Unfortunately and very sadly, the massive chilul Hashem is now directly impacting those that are the most vulnerable in Eretz Yisroel who suffer from illness and poverty. This is directly attributable to hooligans who have total disregard for behavior becoming of Charedim, which should mean G-d-fearing,” Friedlander said. Friedlander is clearly agitated—and the PR guy has good reason: non-religious donors are shocked and outraged, and are taking it out on their Charedi beneficiaries, Friedlander’s clients. Friedlander says he’s going public after a long night of phone calls with clients reporting an alarming level of verbal confrontations with donors. It's important to educate the public, the Gedolim have always had the opinion that one should only take charity from a Shomer Shabbos. “I ask: where is the Charedi leadership? The only way these Rabbis will listen -when us American Jewish suckers stop giving them money. I will make sure to tell them How i feel when they call my house 20 times a day for every charity I never heard of. I know of a big philanthropist who sent a huge amount of money as a donation to one of the mosdos very active in the demonstrations, as a direct result of the brutal treatment the Israeli government is treating the frum yidden. I guess that donor didn't ask Mr. Friedlander..
#1, you are making a blanket statement that is both false and misleading. If you pledged not to benefit from any institution that took money from "non Shomer Shabbos" you would not be able to walk into virtually any yeshiva, shul or take money from any tzedaka organization around. This is a very gray area and if you would like to elaborate on "all of the gedolim" that have "always had the opinion" that would be interesting to hear. But the charedim in Jerusalem wouldn't survive if not the help of the government - secular Jews. Money. Security. Educated-doctors. Utility. You name it. Its amazing how much anti frum sentiment ive seen on the internet sinnce the beginning of the whole riot episodes, even on the "frum websites". Now for all of those freaks who are ranting at the chareidiim in Eretz hakodesh, how about looking at the pictures themselves. Isnt it funny when you look at one picture and you see a group of CHAREIDIM throwing rocks at cops but in the next picture you see a group of CHAREIDIM EMTS treating the cops that got injured. There are two points id like bring out from this. 1. Isnt that a contradiction to all the media reports that the "chareidim did this......." etc. In not one media outlet did they actually mention about the GOOD CHAREIDIM. At least let the FRUM MEDIA outlets should be reporting this to break the CHAREDI STEREOTYPE. No everyone has to to go on a rant to blast the frum world and our holy gedolim. FOR ONCE TAKE A LOOK AT THE GOOD SIDE. 2. What would you answer somebody who shows you this contradiction? Answer: The rioters are only a small handfull but in general most frum yidden are non violent caring people. No instead lets rant abount the handfull of trouble makers. Again stop looking for all the bad in Judiasm. Looking for the good will only bring Moshiach closer. “ I know of a big philanthropist who sent a huge amount of money as a donation to one of the mosdos very active in the demonstrations, as a direct result of the brutal treatment the Israeli government is treating the frum yidden. Why only religious people? I have a problem believing that any Gadol would say that especially since their institutions receive a lot of money from people who are not neccesarily Shomer shabbos. Besides, all Jews have the mitzvah of tzedokah. And that these so called religious people are causing a chillul hashem, damage to property (which is a form of stealing) is all this okay by you. The non-religious are on a much higher level than these so called religious animals. Just because you have a yarmulke, black hat and kapota means exactly nothing if you do not act accordingly. Rest assured, if the protests were limited to calm gatherings where people said Tehillim, none of this would be happening. In fact, there would be a great deal of respect for the protesters. Now that the hooligans have caused so much trouble, I wonder why people like #2 continue to defend many Issurei D'oraissah including throwing rocks at people, making fires in r'shus ha'rabim, and many other issurim. It's not about being anti-Charedim, it's about being pro-Torah. “ “I ask: where is the Charedi leadership? I don't know if you have money or not! But don't be a big mouth to say I will give I will not give evan you have money its not yours its from hashem and like he gives he can take so don't feel good with money just dank hashem for it! the rioters are a kiddush hashem - theyre being moser nefesh its a shaas hashmad. “ Its amazing how much anti frum sentiment ive seen on the internet sinnce the beginning of the whole riot episodes, even on the "frum websites". Now for all of those freaks who are ranting at the chareidiim in Eretz hakodesh, how about looking at the pictures themselves. Isnt it funny when you look at one picture and you see a group of CHAREIDIM throwing rocks at cops but in the next picture you see a group of CHAREIDIM EMTS treating the cops that got injured. There are two points id like bring out from this. How long will these idiots continue to make people hate the Orthodox??
" Oh, I must become Orthodox and close my store because the Charedis burned fires in the streets and got into fights??!!" People respond much more easily to gentle, sincere calls, than they do to a bunch of violent, wild kids. There is an old Yiddish saying, "You can catch more flies with honey than with vinegar." Its actually making INTER-national headlines as I have seen this mentioned in several regular media publications. So now the chillul hashem is world-wide! P.S. They are referrind to the rioters as "violent Hassidim" Great-just what we need! So, go tell Shottenstein, Stone, Rennert, Weisel, Wexler, etc. that all the money that they have given to Yeshivas, Art Scroll, hospitals, etc is treif and they should stop giving tzedaka becuse you, the holy Chosid Shoteh, refuse to take theri money. I am appalled (although unfortunately not surprised) how many charedi publications contort themseleves to try to cast these violent wack jobs in a positive light! Take a look at this weeks Yated: the Editor (and owner) Pinny Lipshits wrote a whole two-and-a- half page article defending these morons as "mikadshei shem shomayim" and demonizing the Israeli Media and Police. Its amazing how folks can never accept the truth which is: NOT ALL FRUM JEWS ARE PERFECT; NOT EVERY FRUM REACTION IS PROPER!!!! Sometimes (even!) Frum folks are bad, stupid, vicious, and just plain WRONG! I say:let the frum Media at least be intellectually honest about all this garbage! I agree with #18 100% gelt is something hashem gives you can see 2 people doing the same think 1 is matzliach and the other 1 is not its because hashem wants so! I ones heard from someone a businessmen that if you don't believe hashem gives every think you don't have to be apicores your just stupid! May we all be matzliach!!! If these rioters are "mekadesh shem shemayim" than you are obviously worshiping another god than the rest of us. These people have caused incredible damage and harm to klal yisroel, have desecrated the name of hashem. They will be punished, not rewarded, for their actions. You say: " What would you answer somebody who shows you this contradiction? Answer: The rioters are only a small handfull but in general most frum yidden are non violent caring people. No instead lets rant abount the handfull of trouble makers. " This sounds just like the argument "not all muslims are terrorists". Which of course is a true statement, but since none of the muslim leaders do anything to curb terrorism, they're affiliated with them. Same thing with these charedim. Since there are no rabbis stopping this nonsense, banning the rioters from shuls, throwing their kids out of yeshiva...etc then they are just like the rioters and ALL of them deserve to be chasticed by the worst of the hillel hashem. #13 i dont knw wat pics u looking at or what stories u reading. I see jews acting like animals, fighting against getting a child out of a home where he is not being taken care of. did the mother deserve to be arrested yes 100%. what were these jews protesting the child being treated as a child or taken out of a concentration camp.? Any Rabbi that is in leadership position in Israel should be vehemently condemning these demonstrations! This is such a HUGE Chillul Hashem! How can you riot against another Jew and cause such great Chillul Hashem to the world? How can these Rabbi's not get up and condemn the sickening Netura Karta that go into Gaza to meet with murderers? How do our Rabbi's stand by silently while these atrocities are occurring? In today's world there are zero differences between these Rabbi's and any other people. These are just job titles. A real Rabbi and one who deserves the complete honor and respect of the title, is someone that is proud to stand up and take charge. Someone that can answer proudly to Hashem after 120 years. In what way are they Mekadesh Shem Shemayim, by damaging property of others? These hoodlums are a bunch of bums not any better than the Zionist Apikorsim. They wouldn't be able to survive if Uncle Sam would stop funding them!! don't think a few Madoffs keep up all of Israel.. its the US donations that keeps them going. I think that any mother would take money from anywhere so that she can stop her kinderlach from crying with stomachs that burn from hunger. YOU go tell her she can't accept tzedakah from a non-Shomer Shabbos to feed her starving babies, O Righteous One! For all those Charedim who love theses riots - I think the organizers should rather arrange some sports activities (like basketball or soccer) to help theses Charedim let out their steam and energy. I think this will solve the problem. We have no more Gadolim we only have Ketanem. All who are afraid to say anything. They all hide when its time to stand up and say something. Reb N. Rosenberg said a very interested thing this week on his hot line, if it Bothers so much for the Godilm that people are mechalel Shabbos,why go out with violence? don't you think if you go out and talk to them about Shabbas and explain them how nice Shabbos it is, don't you think you would accomplish a lot more then trowing stones? My daughter, who lives in Sanhedria with 4 young ones,can no longer cross the street at Rechov Bar Ilan and Shmuel Ha'Navi to do her shopping? Why? Because some "righteous" Jews tore down the traffic lights !!! Street lights have been torn down on major intersections all over Jerusalem. The Yidden who live there !!! The shopkeepers who have lost their customers !!! The mothers and fathers who take busses (that are no longer running) to work or Yeshiva !!!! So you tell me, what message was sent ? And to whom? Who will fix the damage done ? Who will pay for the damage done? I will give my money to organizations who "act frum" not just "look frum". I think its the biggest Chillul Hashem i ever witness,i am ashamed to go out on the street when our brothers behave in violence, what should any one think? even modern Charedim, what happen to our Gedolim? the entire yiddishkeit could suffer. You are a first class Moron! Charedie EMS (Magen David Edom) treat wounded (terroist) arabs as well. Go back to Lakewood and / or consult a concert ban rabbi before you come here. Either you are full garbage and just trying to incite the crowd or you are just plain outright stupid. What do the rioters have to do with the chesed orginazations in geulah? You probably dont want to give money any more since you just want to buy yourself a CHANEL handbag. Its amazing how stupid your comments are. 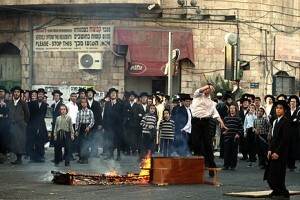 repulsed by these riots but thousands of potential baalei tshuvos. There is no greater chillul hashem than this. All those mesholochim here in Baltimore don't mind checks from conservative shuls and non-shomer shabbes as long as it green dollars, a lot of these mosdos would be broke if not for the money from " freie' yidden. You are 100% correct. We see this same cycle in all areas of life. We, as frum yidden, are just as guilty when it comes to Muslims. The fact is that 99% of Muslims are not terrorists... but we see comments like "kill all the Muslims", etc. The same holds true here. 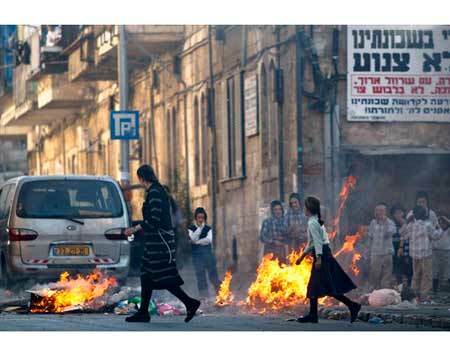 Chareidim who commit arson, or throw rocks at police and sanitation workers are a small minority of people who in no way represent Torah. They are complete phonies who dress up to look like us, but are nothing more than violent criminal terrorists. Perhaps that is what we should call them... "ANTI-TORAH TERRORISTS"... it has a nice ring to it, and this way a clear distinction is made between those erliche yidden who truly live Torah lives, and the criminals who live among us and wear our clothing. Hashem gave me the money to do what I see fit-and these barbarians rioting are for sure not fit and might actually be assur to give them money, because they are commiting a chilul hashem and damaging other peoples property. so what do you have to say now BIG MOUTH!! You always compare the virtuous Orthodox Jews to vile and evil Muslims or other evil doers. Your tiny minority of terrorists view of the Muslims is poisonous and false. They have never protested the terrorist actions of their brothers. Which Muslim group protested Mumbai in unambiguous language? When they condemn terrorism they mean any resistance to Muslims. They don't consider suicide bombing terrorism because it is against people who oppose Islam and this includes children. Stop comparing us to them and stop standing up for those who secretly hate you. It goes even further than whjat Friedlander says: There will be a backlash of Chareidi financial support for the Chareidi community in Israel, particularly from US. Sometimes the only way to have an influence on a person is to hit them where it hurts: in the pocketbook. I don't know if the riots are right or wrong i'll let the gedolim decide that.but to say i'ts wrong because some mechalel shabbos doner will stop giving money is definitly wrong. 1. Why is it that when the Muslims do it, we condemn them (to put it nicely), but when we do it, it's Mesiras Nefesh? You might be surprised to know that when they riot, they also consider it "Mesiras Nefesh" for their religion. 2. I don't believe it will be sufficient that the gedloim condemn it. This is a symptom of a larger problem, where bochurim who have little interest in learning all day - and even "good bochurim", such as I was back in the day - need to find outlets to their energy. Until we integrate more work/skills training/sports into their day's activites, this will unfortunately often be the outlet. The riots in מאה שערים will undoubtedly end. All you people who support the riots understand that nothing good will come out of these riots. Nothing! What will happen is that people who admire Shomrei Torah and are looking to join, and to begin keeping mitzvohs will take a second look. Some will overcome the challenge and continue on their path towards Mitzvohs. Others will not. And for those people, the rioters will stand on the יום הדין and have some explaining to do. Once פסק דין is rendered, דומה will eagerly await them and seat them accordingly. Freidlander has the experience in various religious circles to know. He is correct in his argument but especially in the chilul hashem it causes more important than the monetary issue. These are not ordinary times,veyn somchin aal haness-we need all the help we can get. 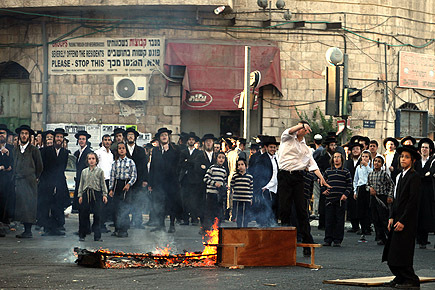 Even Rav Sternbuch has said that violent demonstrators "are not part of the community. The Grand Rabbis of Belz , Ger and Toldos (all of them) should form immediately their own enforcement group at demonstrations and hand over violent participants to the police. Mr. Friedlander got it wrong. I am chareidi, and I ill also boycott chareidi charities because of the riots. I will be sending my kollel shomer hachmos pushka money to the fund for the japanese boys. I will refrain from any donations any yerushlayim mosod, including the yeshiva I went to. If, G-d forbid, even one innocent child in Yerushalayim goes hungry because of your "Kiddush Hashem", I hope you're sure YOUR "mesirus nefesh" in "protesting" was the right move. Anyone, that has ever studied in EY, knows, that there is a lot of shababnikim, out on the streets of Yerushalayim, always looking for an opportunity, when to start hafgonos. The way how to have a Mochoah regarding Chilul Shabbos, is not the way that can be seen in the media. There are other options open, for those wishing to bring the Jerusalem Municipality to its knees, but this is not the way. BTW, if you all care to remember, Yerushalayim is without a Chareidi Mayor, due to its own doing. They should thank Ploni Almoni and their own. a rabbi should lead his people not let his people lead him and definitly not you american sucker. I do not like the riots, but I still have respect for our gedolim. You on the other hand show yourself as someone who respects your own opinion and expect the gedolim to repsect yours as well. By the way......whats your name "Rabbi"
This is funny. When there is no more money left to give out, they start blaming the riots. Let them say the truth; they lost their jobs and are not interested in donating to anyone anymore. of the Rebbes is most to blame. The Mir rosh Hayeshiva and Rav Shternbuch have condemned this violence. #64 The so-called gedolim have been misled many times by so called moronic askanim . Rabbi Freidlander knows the realpolitik and the dire consequences that will now fall upon the charedim to be crushed by the secular. Thank the silent so called gedolim thruout all this falling soon on their people. I and none of my yeshivish friends will support these institutions participating in violent demonstrations.The consequences is what they sowed by their silence and what Freidlander is correctly concerned about. Shame on these Gedolim for the silence #64- Don't be aloser like them!